And yet, even though they have to scroll past it to click the [Post Your Question] button, new users don't seem to look at the preview at all. I suspect it's partially because the preview isn't called out in any way, it just looks like text on the Ask Question page, and as we know People Don't Read, they just scan for the nice button. Label the preview "Preview - This is what your question is going to look like" (excellent wording improvement from deceze). Set it off from other text with a background (or something). Add "Read the Preview above before posting" with a list of things to check. Most people won't read this, but hey, we can hope for some. Obviously that's just an initial draft, we'd want design it properly and road-test it. Wait, we don't want barriers to questions? I would support making them checkboxes, and don't let the user post until they're all checked. Yes, some people will just automatically check them without going over their post. Those people are hopeless. But for the people who do want to do things right but don't know how, this can be very helpful. 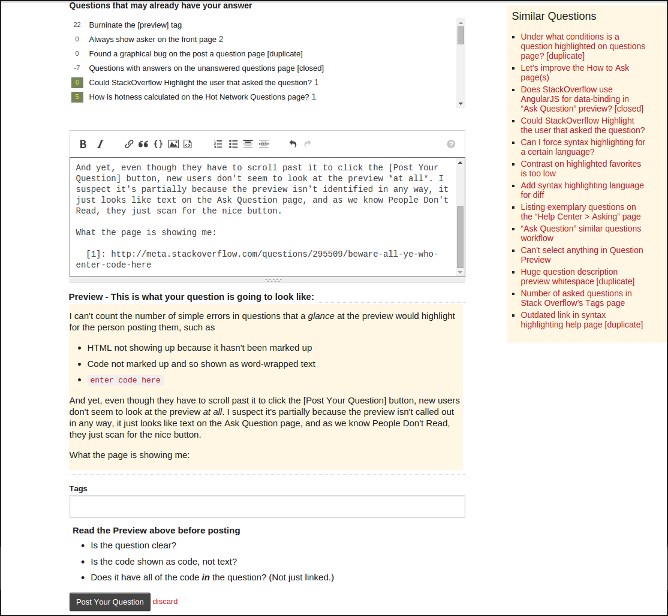 Add "Read the Question Preview above before posting" with a list of things to check. Most people won't read this, but hey, we can hope for some. I don't think those points would help in the least. You can highlight things all you want and point big fat arrows to it, people who do not want to see won't see it either way. What colour the "yadayadayada" between the textarea and the submit button has is pretty irrelevant for someone scrolling right over it. 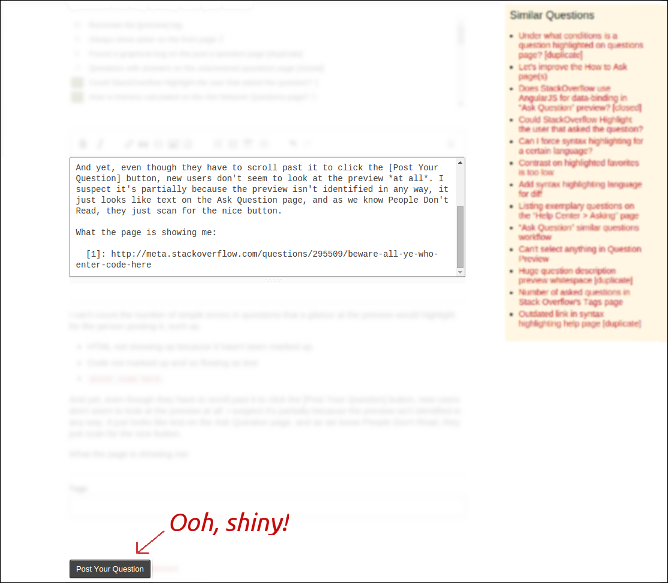 It is telling that often questions which are clearly missing their HTML stay that way forever. Even after posting the question the OP does not notice! Or if they notice, they don't know how to fix it. Or perhaps they believe that "it's a problem with my browser and others must surely see it okay because I've pasted it into the textbox after all, right?" Nothing will help those people, we do not need to clutter up the UI even further. Label the preview "Question Preview". That I can get on board with. The preview should clearly be labeled as "This is what your question is going to look like: ..." – It will clarify things for the few people who do pay attention. To help those along further, you should add a "...doesn't look like you expected? Read the Editing Help." Beyond this, adding more text and having people jump through more hoops and checkboxes probably won't do much. People are great at ignoring messages and clicking the buttons. The problem here may be that there's no mental connection or expectation between the text input and a live preview, because the preview is not seen during text input. If you'd put both side by side, that connection would be a lot harder to miss. That may be a UI change which would reach many more users. Not the answer you're looking for? 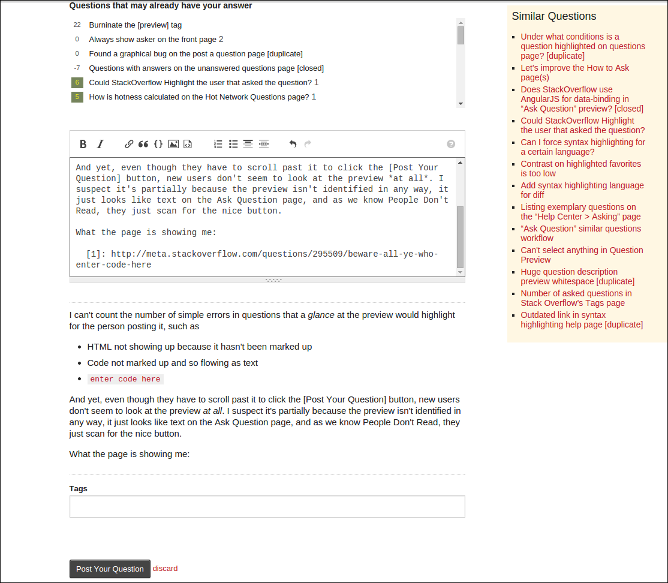 Browse other questions tagged feature-request asking-questions new-users question-quality . Can the question asking page be improved with a reminder about MCVE? Can I download the Stack Overflow editor?